Since Nation at Risk, NCLB and RTT, the once thought sacred institution of school boards as catalysts to ensure local control of schools is being redefined and are under heavy attack. Increasingly, school boards are disappearing from the discussion of promoting student achievement and their role as educational decision-makers have significantly declined. The aims of public education are gradually being federalized and privatized. 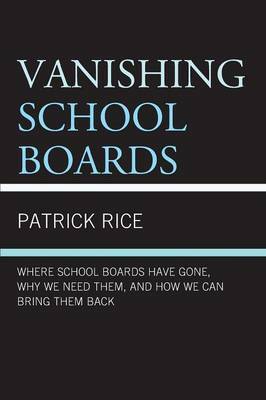 In Vanishing School Boards, author Patrick Rice give various reasons for the descent of school boards, reasons why school boards are vital, the importance of board training and how the superintendent can assist the board in their mission of delivering a quality education to all students.